Once again, it should be noted that the map above says nothing about vote share by county. 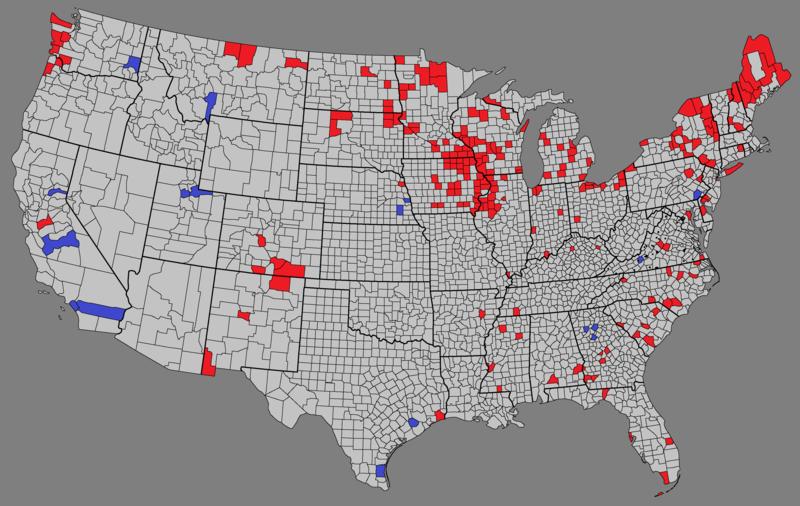 For that you may find our 2016 US Presidential Election Map By County & Vote Share interesting. The main thing this map clearly shows are the large number of counties in the North-East and Midwest that went for Trump over Clinton. The effect was large enough to flip the normally Democratic leaning states of Iowa, Michigan, Pennsylvania, and Wisconsin into the Republican camp. Stanislaus County CA voted for Clinton according to CA SOS Statement of Vote so should be uncolored. Likewise Fresno & Riverside Counties voted for Obama in 2012 & shouldn’t be colorized. The only 2 counties that switched in 2016 from red to Blue were Nevada & Orange which by the way is the 5th largest County in the Nation by population & has the largest # of registered Republicans of any County in the Nation.